Hey everyone, It’s never too early to start talking about Mardi Gras. Perhaps one of the best days of the year for food lovers. Mardi Gras is the day before lent where being gluttonous is actually encouraged. Some people even refer to the day as Fat Tuesday. Although, we all have the same common goal of staying slim here which is really hard to do when talking about Mardi Gras. The best place to celebrate Mardi Gras is in New Orleans and Cajun food sure as heck is not a top healthy food on our list. However, eating healthy and still enjoying Mardi Gras can be done. This article is dedicated to Healthy Cajun Recipes. Cajun food is actually really easy to make healthy. There are plenty of healthy Cajun recipes that already exist. For the ones that are not healthy a few simple tweaks will get them as healthy as anything else. You may find yourself adding these recipes as a regular part of your diet because they are just that good. However, if you do not like spicy, you may want to skip this article and go to my homepage to find something else. Cajun food is famous for being so spicy, it can make the toughest eaters break down in tears. The recipes I will be discussing will not be that spicy, of course. Although, these are still not for those with weak spice tolerances. Without further wait, let us get to the recipes. This recipe is simple yet encompasses all the flavors of the Cajun cuisine. Combine sausage, shrimp, Cajun seasoning, white wine, garlic, onion, chicken broth and butter in a sauce pan. Reduce and simmer. Boil whole wheat spaghetti in a pot, drain, and pour mixture on top of pasta. 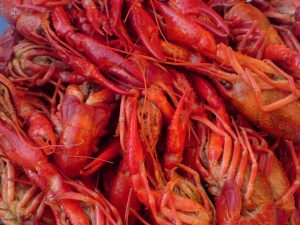 One of the most classic Cajun food. To make this jambalaya healthy. Leave out the sausage replace the white rice with brown rice and leave the rest the same. All the unhealthy calories were in the sausage and white rice. Brown rice has less calories so you can have seconds without feeling guilty. Mahi is already healthy. You do not have to tweak this recipe at all. Just cook and Enjoy! Craw fish boils are pretty much already healthy. Potatoes, craw fish, sausage, corn, carrots, shrimp all boiled in a pot. Be careful with the sausage and potatoes. Leave them out if you can. That is where this dish loses its healthy certificate. I hope these recipes can be of some used for you. Hopefully these recipes will still allow you to enjoy all the delicious foods Mardi Gras has to offer with suffering from the guilt of being glutinous. Good luck on your weight loss journey and have a super safe Mardi Gras and a fun one! leave your comments at the bottom. Thanks for reading!